From twelfth century monks comes "d'Angelot," or the cheese "of angels," as it may be translated. A strong-scented cheese, its flavor highly contrasts the fungus-like aroma it produces. A creamy milk-made texture and soft rind have continued to provide a consistently beneficial consumption for all lovers of "fromage." Often, it is eaten at room temperature, and does not necessarily need any other components, although crackers and wine are a classical tradition. According to ancient historical manuscripts, one monk claimed that any fine meal should conclude with this cheese. Its origins lead to the city-state of Normandy along the northern area of the English Channel, almost parallel to London, England. 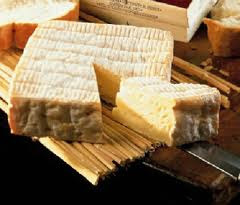 In fact, its unique and classic nutty flavor have earned it the name of the village it was most popularly produced in: Pont l'Eveque. 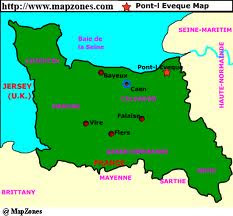 There, (as seen below) along its North Eastern border lies Pont l'Eveque, where its cheese became exceedingly popular in the 17th century. Soon after, as France became a well-established center of finery, "d'Angelot" met all the criteria of one refined food its home country would be known for among thousands of others. When sampling this cheese, I personally experienced the unappealing smell it produced foremost. However, as cheese ages, I kept my mind open to tasting all that was presented to me, strong or not. I was exceptionally pleased to find that the flavor was both rich and nutty. Its soft texture was not too creamy or hard, and surprisingly the aroma it produced only added to the subtle hints of France I could literally taste on my tongue. 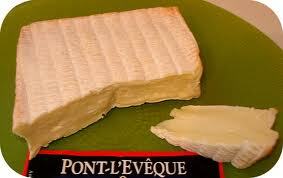 As the monk originators claimed, Pont l'Eveque was truly "sacrée!" France should be proud to own up to such a decadent food.